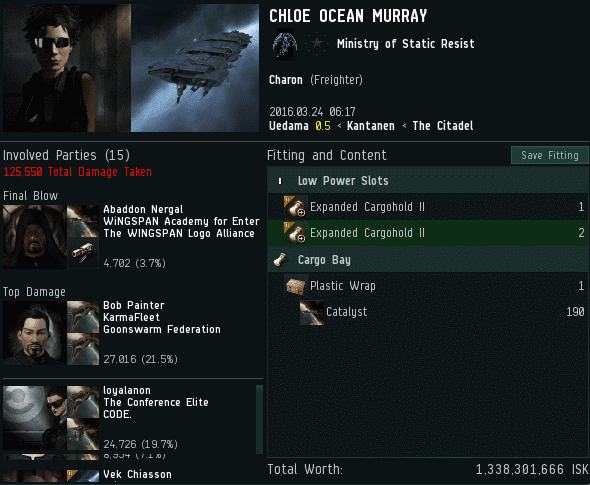 Highsec industrialist CHLOE OCEAN MURRAY has long threatened the peace and security of highsec. Last year, The WINGSPAN Logo Alliance PvP'ed the carebear and were stunned by CHLOE's attitude on voice comms--which they recorded and put on YouTube. Fast-forward several months. Agent loyalanon attempted to negotiate the surrender of CHLOE's jump freighter, which was intercepted by a New Order bumper while trying to sneak through the Niarja pipe. CHLOE seemed to feel she was above it all. She'd been playing EVE since the alpha but never took the time to buy a permit. I'm sure it was the next item on her to-do list. Like other carebears, CHLOE bragged about her power. In a strange twist, she used that as a reason to buy a permit. ...Or not. Despite her earlier pretense of "respect", CHLOE was reluctant to buy a permit. Struggling to get through to the carebear via text only, loyalanon suggested a casual conversation on TeamSpeak. Sadly, the convo was inconclusive. 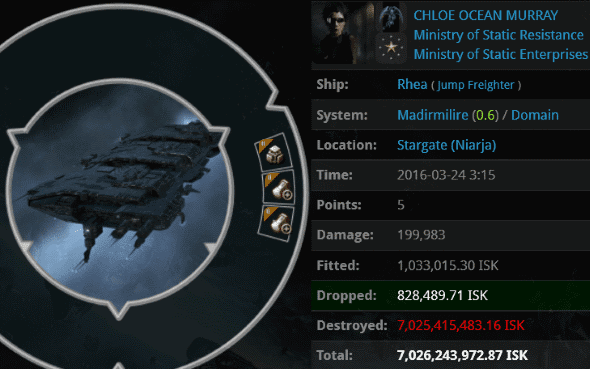 The fate of CHLOE's 7 billion isk jump freighter was sealed. 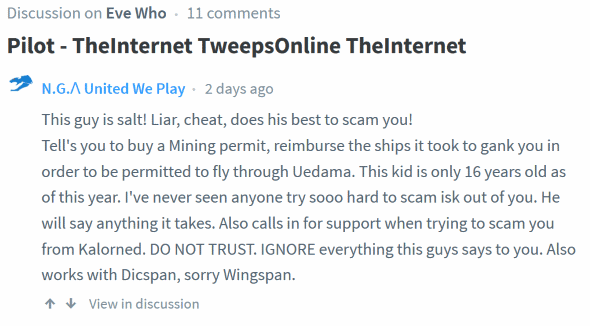 This immediately caught the attention of The WINGSPAN Logo Alliance, which made contact with the New Order and warned our Agents about CHLOE. Within the hour, a file was opened, and one of the New Order's finest investigators was put on the case. Agent TheInternet TweepsOnline TheInternet insinuated herself into CHLOE's life. Within minutes, they'd agreed to meet up. Their goal: To prevent CHLOE from losing any more industrial ships. Over the course of the next hour, the two engaged in what TheInternet referred to as "voice PvP". 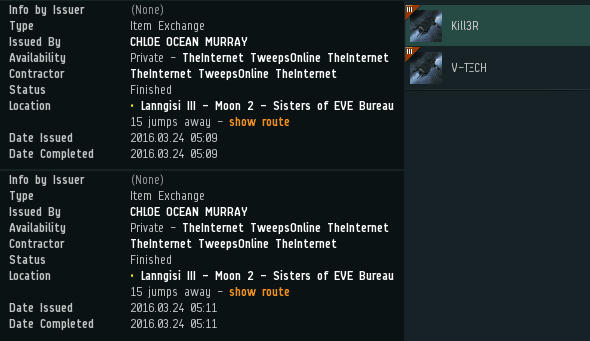 TheInternet and her fellow Agents on TeamSpeak consistently won the voice PvP, resulting in the transfer of 13 billion isk. Finally, we confiscated what he referred to as, and I quote, "my daughter's birthday Tengu", as well as another Tengu of the ordinary variety. (Both hulls sold for the same price in Jita, so I don't know what the difference was between the two). CHLOE's faith was further tested when she was asked to haul 190 Catalysts through Uedama. She wasted no time in abandoning the Code, choosing to cut corners instead. Hauling the package in a bot-aspirant manner, her freighter was destroyed by a combined fleet of the New Order and WINGSPAN. TheInternet's fears about CHLOE's true motives were confirmed when she checked up on CHLOE's EveWho comments. CHLOE was against us! So much for their blossoming friendship. The mudslinging continued. Agent Kalorned, also present during the voice PvP, wasn't spared. Ultimately, the WINGSPAN's intel proved to be solid; CHLOE was a difficult customer. It's only through the power of the Code that our Agents are able to believe--with all confidence--in the redemption of even a rebel hauler like CHLOE. Her redemption will have to wait, but it will come eventually. "voice PvP" = Bonus Room antics. CHODE. slave loyalanon must be busy trying to recoup the 40 billion in ships he recently lost. Lol someone stole 50 bil? I hope he puts it to good use in killing more carebears! I always enjoy reading the antics of our top diplos and celebrities. 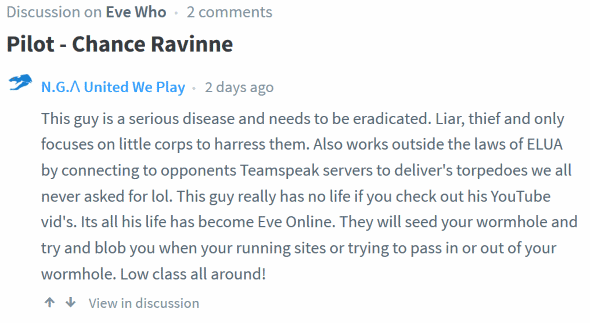 It's also heart-warming to note that we work in tandem with other Highsec PvP entities. As for CHLOE... Giddy, barely coherent drivel, I'm afraid. 50 billion but loyal can't do math so its ok. He relies on others to do math for him. Good FC tho, between his outburst of rage when things don't go his way. He's been mad lately as there has been a lot more failing. did my catalyst touch you somewhere? Obviously that Anon has been touched by your catalyst. Probably very deeply in a personal place. Loving these sweet ganker tears. Please quote where you think you see tears, miner. It was 50 billion actually. Elite Voice PvP leads to discovery of inexhaustible salt deposits... Another glorious victory for the New Order!!! Just watched the youtube video that was linked. Wow, I am genuinely afraid for that man's children. I wonder why the second freighter was ganked when Cloe obviously has bought a mining permit for 10 million. Permit tank - worst tank it seems. I just wanted to note that five hours after that last freighter gank, CHLOE may have put her character up for sale. Has she abandoned her mining pilot and created a new ganking character to show her dedication to the code, or is this simply a means whereby the can continue her bot aspirancy under a new guise? 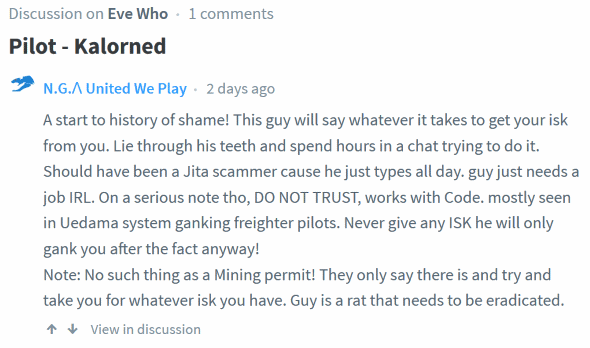 Not sure but code is disbanding due to lack of goon funding, and stolen catalysts! The elite voice pvpers indeed failed to explain why the second freighter was ganked when Chloe actually paid for a mining permit (and then some more). I'm sure the answer is something like "The permit was instantly revoked because of bot aspirant behaviour" I think liar might be a fitting description for the persons involved. Chloe commited three violations by anti-tanking her freighter using cargohold expanders in each low slot. She effectively purchased a permit, then proceeded to fill the freighter with as much cargo as possible, thus violating the Code of Conduct. The New Order is the real victim here, since Chloe attempted to scam us. "Cursed is the Freighter, complicit to the miners, descendants of their aspirancy, they move through the cosmos hauling ill-gotten spoils in their bloated bellies. If Miners are the head of corruption, the Freighter is so the instrument of the right hand. Without mind they move like venom or disease in the veins of a sick child." YOu will be surprised bus the so called code does not contain a prohibition regarding tanking freighters. In fact the so called code does not relate to freighters at all. There is no violation. Code are true to thier image. The Father of high-sec has explained in clear terms that the Code of Conduct covers freighters. Thus, the Code of Conduct now applies to all who dwell in the Saviours space. 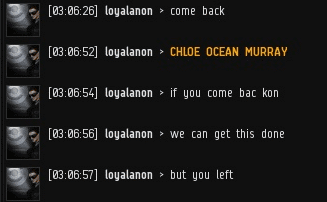 Therefore we can safely conclude that CHLOE was in-fact in violation, and effectively requesting elite PVP combat with our Agents - which was granted free of charge. Another example of the New Order going out of our way to help belligerent freighter pilots, only to be treated with complete disdain.